Welcome to the age of 5G. 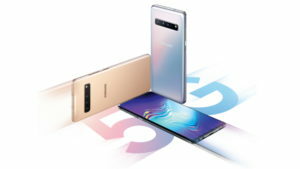 Today Samsung launched its Samsung Galaxy S10 5G in South Korea, making it the first major player to debut a 5G phone. The next generation of mobile networks was a favorite topic at Mobile World Congress this year, with companies showcasing their new 5G-capable devices. 5G is expected to be 10 times as fast as 4G. The rise of 5G promises a range of exciting new opportunities for mobile marketers to leverage high-quality video, AR/ VR content and faster app download speeds (from 4G’s 100 mbps to 10 gbps), to deliver impactful ad experiences to users. One improvement 5G will bring is decreased latency, or the total time it takes for data to reach a device. Latency is a major issue for mobile marketing which 5G promises to solve with its high speed connection. Eliminating lag time is a crucial benefit, given that 46% of consumers say they would not purchase from a brand again after an “interruptive mobile experience.” The same study by Google found that when people have a negative brand experience on mobile, they would be more than 60% less likely to purchase from that brand again. A faster network means decreased loading times, lower bounce rates, and a better overall customer experience. With lower latency, which is expected to be near one millisecond, interactive ads that require heavy data processing will be able to evolve newer and more innovative ways to engage with customers, whether that’s through AR or gaming methods. Being able to interact in real time is also an opportunity for new applications, like self-driving cars. Key takeaway: 5G will bring more opportunities for marketers to provide immersive, interactive ad experiences to users. While 5G is going to be super fast, it is also going to have a much shorter range than 4G. 5G networks will require higher frequency radio waves to transmit massive amounts of data . These high frequency waves will have a shorter range, requiring the installation of more base stations. Verizon estimates 5G networks will need five to ten times more 5G base stations than what it currently uses – an increase of up to 2 million more 5G units in some cases to achieve nationwide coverage. What this means for mobile ads is enhanced precision targeting and the ability to undertake location-based advertising. Access to location data means the ability to serve timely ads to users who opt in to receive notifications while they are in relevant areas like busy shopping centers. Given 60.1% of people surveyed rely on their phones to research products in store before making a purchase, this can be a powerful tool for app marketers looking to implement an effective omnichannel marketing strategy. Key takeaway: 5G will provide marketers the ability to serve users more relevant ads based on their location and browsing behavior in real time. Faster network access means more people going online, and data shows that access will be through smartphones. In fact, in 2020, the number of smartphone users worldwide is expected to reach 2.87 billion. As of February 2019, mobile browsing made up almost half of all global web traffic . Mobile video has grown a lot over the past year – in 2018, 1.87 billion users are expected to watch videos on mobile phones, which is an 11.9 percent increase over 2017. The in-app share of mobile video is forecast to grow from 78 percent to 84 percent in 2023. 5G will enhance this experience, increasing viewership of in-app ads with its high speeds and high quality video. This will lead to new possibilities for ad formats, such as long video ad formats that deliver higher resolution ads without buffering. Key takeaway: People will continue to consume most of their information via mobile devices and much of it in the form of mobile video. The music industry is ready to hop on to the 5G band wagon as well, with AR/VR promising immersive concert experiences and musical collaborations that bring artists together without actually requiring them to physically be together – possible due to 5G’s low latency levels. In an IoT environment, the user listening experience has the potential to blend seamlessly, allowing the listener to transition across devices and locations without skipping a beat. Key takeaway: Brands will be able to leverage the power of AR and VR-enabled immersive media formats in the age of 5G. One of the most talked about possibilities heralded by the arrival of 5G is an increase in the number of connected devices at relatively low levels of power and cost. With the expansion of the Internet of Things (IoT) and the advent of connected smart objects that consumers use on a daily basis, comes a wealth of data to help marketers understand and connect with users through everything from wearables to home appliances. What this means for mobile marketing is increased personalization and better targeting. Better connectivity also means improved real-time data capabilities, whether through location-based marketing or push notifications. This could provide the opportunity for timely, targeted delivery of relevant information to connected users. Key takeaway: Mobile marketers will be able to market at increasingly more touch points across the mobile user journey in the age of 5G. 5G promises to keep the marketing world on its toes with dynamic new application possibilities. Some carriers have already begun to phase in 5G networks, with AT&T, T-Mobile, and Verizon each deploying some form of 5G coverage in select markets. These versions, however, do not have the full capabilities of 5G, as they are each still operating on existing LTE networks. 5G networks will require significant infrastructure upgrades that will take time to complete. Reem Zubaidi is a content writer at Motive. She has a Journalism and Communications degree from Northwestern University and a Master’s degree in Public Policy from the University of California, San Diego. In her spare time, she can be found drawing, painting, or hiking.